The Ecuadorian Chocó is one of the most threatened tropical forests on the planet. Located within the Tumbes-Chocó-Magdalena biodiversity hotspot, it rivals the Amazon in biodiversity and far surpasses it in terms of endemism. 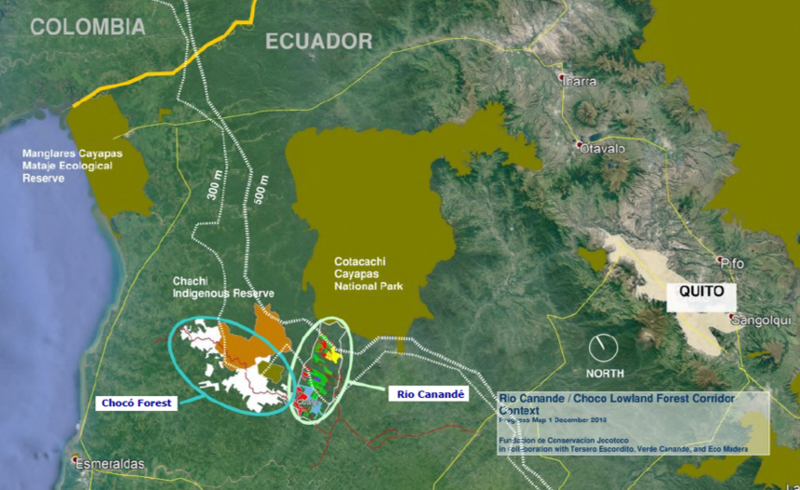 New efforts are underway to secure a future for the Ecuadorian Chocó by establishing connectivity among three reserves that together span over one million acres of land and almost 5000 meters of altitude. With less than 2% of the original lowland Chocó forest remaining and an annual deforestation rate of 2.5% – mostly from conversion to oil palm – the Ecuadorian Chocó must be saved now or never. 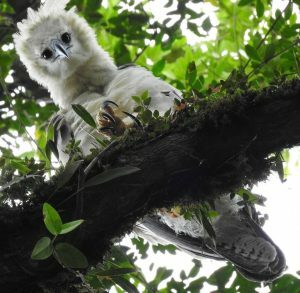 The Ecuadorian organization Fundación Jocotoco has developed an ambitious conservation plan, backed by international organizations including the International Conservation Fund of Canada. The plan takes advantage of a unique opportunity to acquire land that will link Jocotoco’s Rio Canandé Reserve with two governmental reserves: Cotacachi-Cayapas Ecological Reserve and El Pambilar Wildlife Refuge. It entails acquiring 56,000 acres of primary and selectively logged forests. The planned land acquisition will protect at least 14 globally threatened bird species, including some endemic to the Chocó region, and over 100 species of mammals, including the most important population of the critically endangered Brown-headed Spider Monkey. It will also protect at least 135 species of amphibians and reptiles, including 29 that are globally threatened. The multi-year conservation effort will establish a buffer zone for both governmental reserves as well as a natural corridor between the three protected areas. Nowhere else on the western slope of the tropical Andes will an entire range of ecosystems, from Chocó lowland rainforests to Andean paramo-high elevation grasslands, be protected. The protection of such a large area is vital for maintaining the ecological processes and high levels of species diversity and endemism of the Ecuadorian Chocó. This includes sustaining viable populations of species with very large home ranges, such as the jaguar and Great Green Macaw. Fundación Jocotoco has established an endowment fund for long-term protection of the conserved lands. The organization will establish the first research station in the Chocó region, providing another source of revenue. Buffer areas will be leased to Verdecanandé, which, along with WholeForest, will apply a model of sustainable forestry that includes timber hauled by cables to avoid threats from road construction. Annual payments of the 20-year forestry lease will cover the salaries of reserve guards. For more information about Fundación Jocotoco or how to get involved, contact Martin Schaefer, Executive Director. For more information about the International Conservation Fund of Canada, contact Carlos R. Garcia, Director of Latin American Programs. Martin Schaefer is the Executive Director of Fundación Jocotoco, and Carlos R. Garcia is Director of Latin American Programs for the International Conservation Fund of Canada.